Anacortes was a small town of 7,701 residents in 1970; it bustles with 15,700 people in 2006. Summer daytime temperatures average in the 70s, dip to the 40s and 50s in the winter. Annual rainfall averages 26″. Along with growth has come a good educational system with four elementary schools, a middle school and a high school. Enrollment runs around 3,100 students. 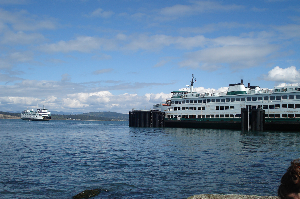 Anacortes has long been called the gateway to the San Juan Islands as its Washington State Ferries ferry dock is the only mainland dock that serves ferries from the beautiful Islands. An exhilarating scenic trip to Sydney, B.C. leads to a short road trip to Victoria. The host city for the 2010 Olympics, Vancouver, B.C., lies 92 miles North while Seattle is 70 miles South of this charming town. Deception Pass State Park, an extremely popular vacation spot, offers spectacular views from its 182 ft. bridge over swirling waters that challenge boaters. There are 316 campsites and 306 picnic sites within the 4, 128 acre picturesque park. Summer events like The Anacortes Art Festival and the Anacortes Waterfront Festival entice visitors. Boating enthusiasts can choose from five major marinas featuring nautical services. Charter boats offer passengers an awesome day of whale watching. The J,K and L Orca whale (killer whale) pods contain around 90 whales. Full grown, a whale can weigh as much as 9000 pounds and consume up to 300 pounds of salmon a day. For those who prefer to spot whales from a local beach, Washington Park is just 10 minutes away from downtown Anacortes. There’s something for everyone to enjoy in Fidalgo Island’s appealing town by the sea.